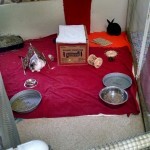 Housing Option for Domestic Community Rabbits. A yurt is a very old type of shelter that can be traced back to Genghis Khan. Nomadic people of Mongolia were observed by Marco Polo using their sturdy round “tents” made of rods and thick layers of felt. Yurts have been used in some of the most inhospitable climates in the world, from the Sahara to the polar tundra. More recent yurts are a moveable circular dwelling made of lattice and flexible wood. Some yurts are set on a wood platform floor, while others are set up on a concrete slab. They come in different sizes, usually 16 feet, to around 30 feet across. Not surprising is that yurts are used as a shelter for animals, including sanctuary rabbits. The versatile yurt may be a cost effective structure for use as a sanctuary for domestic colony rabbits, a rescue/adoption building, and/ or medical unit. A total of five 30 ft. yurts housed three hundred feral/community rabbits at Best Friends Animal Sanctuary in Utah. Photos courtesy of Michele Page, Rabbit Caregiver, BFAS. The yurts were set up on wood platform floors that were covered initially with tarps. The tarps were replaced with vinyl floors in some of the yurts due to breakdown of the tarps from hard use. The floors were easy to sweep and mop. All yurts were cooled in the summer with swamp coolers and ventilated using the up-lift in the center of the dome. Electric heaters were used for heat in the winter months. Double laundry type sinks and running hot and cold water were in each yurt. Electricity and plumbing for sinks was relatively easy to install. Solar panels can be installed in appropriate climates, dramatically cutting the cost of electricity particularly if you put up the yurt as long term housing. A basic yurt can be put up by 4 people in around four to five days, more time needed for plumbing, electricity and the construction of inside and outside connecting areas for the rabbits. 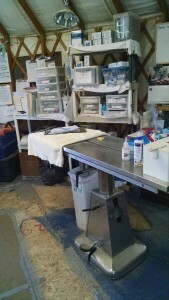 A portion of one yurt can be set up as the medical area using a stainless steel vet examination table or table/s that allow for easy cleaning and disinfecting. Stacked shelving, sealed containers for medications, supplies, a refrigerator for medicines needing refrigeration, special rabbit diets and produce will be needed. In addition you will need a sharps container and a lock box for medications considered narcotics, a log for controlled medications and appointed responsible person/s that are keepers of the keys to the box. 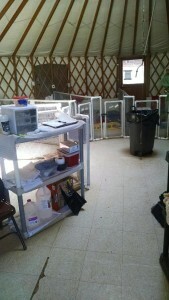 If there are a number of ill rabbits or those that need quarantined, these rabbits can be housed in the medical yurt during illness or post surgery and treatment. Depending on the floor area of the yurt you choose, the inside can be converted into angular shaped runs for the rabbits. Use the center of the yurt for supplies. Plan on a 4×5 or 5×5 feet space for 2-3 rabbits, multiply this out according to the square footage of each run in the yurt. 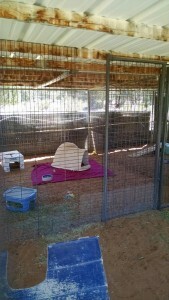 Gates and runs can be constructed from inexpensive PVC pipe and ½ hardware cloth. 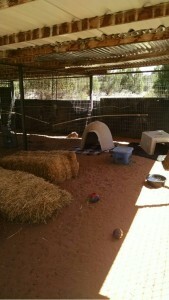 Other supplies for runs include: blankets, rugs, towels, rabbit safe toys. Large feeding bowls, (round metal pans are good), and large water bowls, or as appropriately sized according to the numbers of rabbits in each run. Tunnels made from large cardboard tubes or pvc pipes, “hidey houses”, made from cardboard boxes, tops of pet carriers or other safe materials will be appreciated by the rabbits. These will give the rabbits a place to get away from each other if they want. Large black plastic litter pans, (mortar pans from places such as Home Depot), filled with wood stove pellets, and fresh hay need to be placed in each run. A general rule would be 2-3 rabbits per large litter box. Newspaper, (not the shiny ads), makes a good litter for the bottom of the pan and is easily disposed of and very economical if finances are a concern in this area. Large plastic garbage cans with a tight fitting lid are good storage containers for rabbit pellets and litter material. The cans with wheels are worth the extra money. If your rabbit food is stored outside, metal cans with locks will keep out wildlife and protect the food from weather. If the numbers of rabbits housed requires the storage of many bales of hay that can’t all be stored in the yurt, a wood or tuff shed makes good storage. An inexpensive way is to cover the hay bales tightly with tarps and place them inside a fenced area. If the property is large enough, outdoor runs can be built out from the yurt, connected to each run inside by a small rabbit or doggie type of door with a slide in door to keep rabbits in at night if needed is best and safest. These spaces will allow you to double the numbers of rabbits the yurt can accommodate comfortably. The outdoor runs can be built on a wood platform or with an earth floor. If using the earth floor, either dig down a minimum of two feet to imbed the fencing or connect a floor of hardware cloth onto the vertical fencing of chain link and cover with earth/sand. A snake and small animal barrier can be placed along the bottom 20-25 inches of fencing using ¼ in hardware cloth. It is recommended that the entire yurt area be fenced and “electrified” if you are in a high predator area. There are multiple types of roofing material available for the outdoor runs: metal, wood, heavy netting. Consider snow loads if appropriate. Sun screen cloth can provide outdoor shade areas. One or two outside doors are needed for access to the outside runs and gates between the runs will give better access by caregivers/volunteers. Locks, combination or padlocks are necessary for outside doors. Be aware that some predators are very adept at opening slide or hook types of locks. There are multiple resources and companies online. 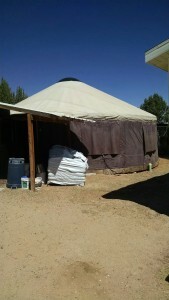 Used yurts can be purchased on e-bay and online stores such as Craigslist. I have included a price list from Colorado Yurt as a starter reference for prices and extras here. This information is from one source only and is not a personal recommendation. Yurts are subject to some zoning regulations. Be sure they are allowed on the site you choose and what the requirements are. 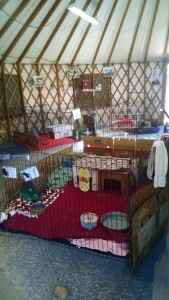 Yurts are a great option for housing colony/community rabbits or other type of rabbit rescue. They are approximately half the overall cost of a metal or wood building. Good luck in your research and I would love to hear from you on what you find.